Topaz can be both very common (when clear, or in certain colors like brown, which can turn blue when treated) and very rare (when found in natural beautiful colors rare to the species, like pink and red). 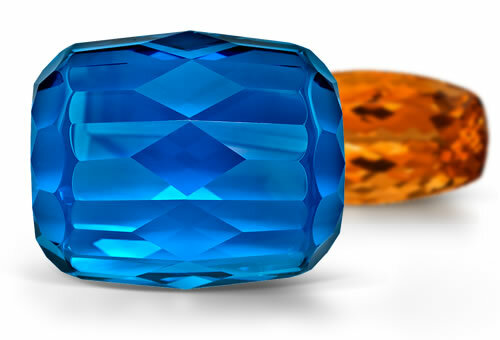 Topaz's popularity stems from the gem's good wearability and affordability. Topaz is also often altered with special surface treatments to give it unusual colors and iridescent effects, like mystic, ocean, kiwi, and orchid topaz. Topaz is also a popular birthstone, as blue topaz is December's primary birthstone and yellow topaz is a birthstone for November. refractive index, birefringence, optic character; possibly specific gravity. The refractive index of blue topaz varieties may be lower than others by as much as 0.01. Some topaz is coated, causing an inert reaction to LWUV and SWUV, different spectra and variable reactions to a CCF test. Blue stones have Type I clarity for blue and all other colors are type II clarity. Stones sometimes contain long tube-like cavities containing liquid, healed fractures and areas that look like they are starting to cleave. Stones might include 2-phase and 3-phase inclusions some of which contain more than one liquid that have not been mixed. Stones have a coating on the pavilion or crown of stone There might scratches of treated surface of the stone that show colorless areas underneath. Surface treated green topaz is blue green in appearance and looks spotty there might also be blue color concentrations in surface reaching fractures.